Mom, the Intern: Friday Favorites: "We're With You"
Friday Favorites: "We're With You"
This is a sponsored post. Expressed opinions are mine. So, you all know I'm LDS (Mormon). As a kid, I had mixed feelings about General Conference, the twice-yearly meeting for all members of the Church where we receive counsel from our leaders. I liked that I could watch church in my pajamas on television (since the meeting is broadcasted), but it was EIGHT WHOLE HOURS of speakers spread out over the course of a weekend. I would often get so antsy and be ready for it to end by the time Sunday rolled around. As a teenager, I started to enjoy it more as I found the messages more pertinent to me. But sometimes, I felt like I couldn't relate at all to the leaders I was listening to. They were all much older and I felt that they couldn't possibly understand what a young adult like myself was going through and the challenges I faced. Recently, though, I've noticed an encouraging change of perspective from church leaders, especially regarding the social issues of young adults (or "millennials," I guess). I've observed an increased outreach from "them" to "us," a bridging of the gap, so to speak. And I love it. 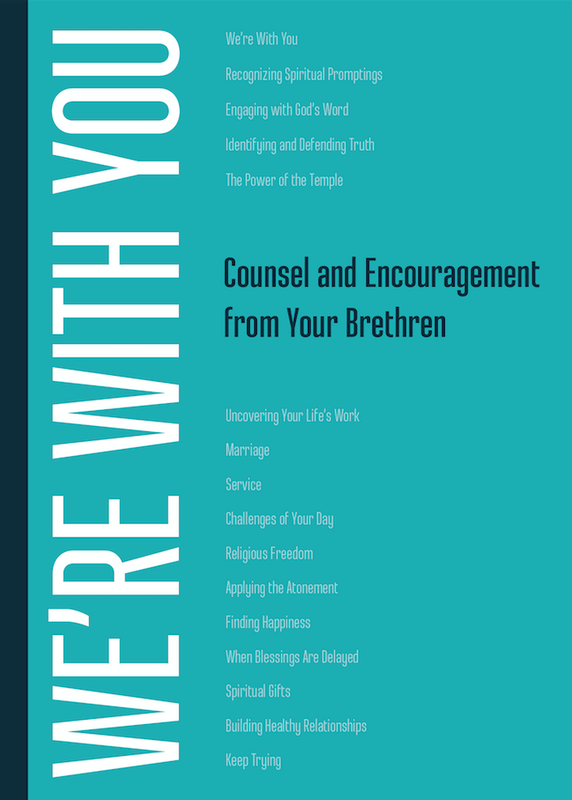 I just received an opportunity to read and review a new book by the First Presidency and Quorum of the Twelve Apostles called We're With You: Counsel and Encouragement from Your Brethren. The book contains excerpts of speeches given by church leaders that pertain mostly to young adults in today's world. It's a unique concept I haven't really seen since President Gordon B. Hinckley released his book, Way to Be. President Hinckley led the LDS Church when I was a teenager and college student, and he always had a way with the youngsters. Even though I'm an old married lady with three kids, I'm actually still young (not quite 30! ), so a lot of We're With You resonated strongly with me. Especially the parts about enduring challenges, because as you know, my mom has terminal cancer. Lately, it's been really hard; I'm not gonna lie. There's a reason I haven't talked about it much, and the reason is it's too painful and too sensitive an issue. I struggle for the better part of every day with the reality that my mom's days are numbered. The anxiety I suffer due to this struggle has created a variety of symptoms for me that are crippling. There is nothing fun about this, let me tell you. I often bitterly wonder why my mom has to go through all this and why our family has been hit with this immense tragedy and suffering. When I started reading this book, I was in a very dark place and in desperate need of answers. So, I took great comfort in the words of Elder David A. Bednar, who said this in the section entitled, "When Blessings Are Delayed:"
But some things I absolutely do know. I know we are spirit sons and daughters of a loving Heavenly Father. I know the Eternal Father is the author of the plan of happiness. I know Jesus Christ is our Savior and Redeemer. I know Jesus enabled the Father’s plan through His infinite and eternal Atonement. I know that the Lord, who was “bruised, broken, [and] torn for us” (“Jesus of Nazareth, Savior and King,” Hymns, no. 181), can succor and strengthen “his people according to their infirmities” (Alma 7:12). And I know one of the greatest blessings of mortality is to not shrink and to allow our individual will to be “swallowed up in the will of the Father” (Mosiah 15:7). So much of this book comforted me and reignited my faith in God and Jesus Christ. It was just what I needed. When I finished, I thought of my siblings who could all benefit from this great book. I thought of the teenage young women I used to work with at church who are now in college and dealing with the struggles mentioned in this book in their daily lives. I thought of my friends. It's so refreshing to read the words of God's ordained leaders, curated just for me and people my age. 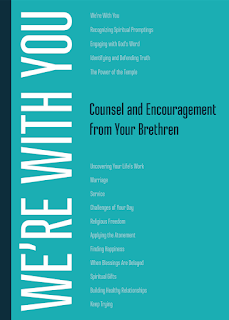 I loved We're With You and recommend it to any millennial Mormon who feels like they could use a little extra nudge in life, someone to root for them and encourage them to keep going when things get tough. Oh, wow, this was absolutely the thing I needed to read today. What a powerful quote. Thank you for sharing it.